Spring is here with a vengeance and I took the opportunity to walk along the waterfront of Wellington Harbour yesterday evening after work to enjoy the war sunny evening and try and get a few birds for my year list (which has not had much action for a while). It doesn’t happen every day, but you can get some interesting birds walking along there, even without binoculars. Spotted Shags are a possibility, and one time I even saw a Little Penguin swimming around right next to the waterfront along which hundreds of people were walking towards the main stadium (it was a few hours away from a World Cup match between South Africa and Australia). The species I wanted, or perhaps expected, the most was the one that would break my, well, duck (in the cricketing sense) when it came to the petrel order for this year, a Fluttering Shearwater. Fluttering Shearwater (Puffinus gavia) not taken yesterday. Fluttering Shearwaters are a small species of shearwater that is fairly common in New Zealand. They are actually an inshore species, and very common in the harbour, which is why they are manageable even from the waterfront. 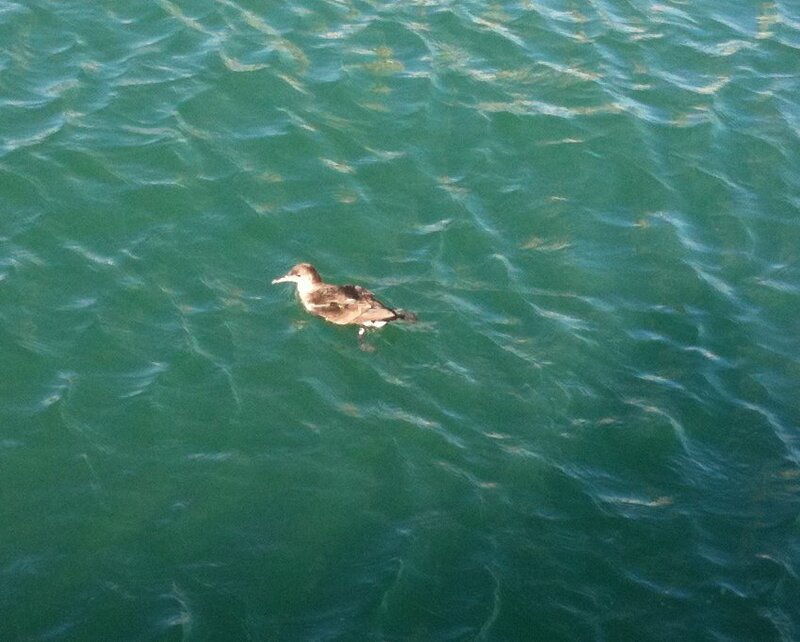 Usually they are fairly distant on choppy days, but I once saw one in the marina, so they can come fairly close in. I haven’t seen one this year yet, but that run of bad luck ended yesterday in spectacular fashion. From a section of pier that was almost at water level I saw one just a few metres away, it dove down, and I moved a long a bit, and he popped up less than a metre away from me. A pretty astonishing view. He wasn’t very bothered, and continued to dive down, at one point I saw he flying round under the water after baitfish. Not the greatest shot, but old phones aren’t really geared up for this kind of thing. The diving thing is actually a rather unappreciated aspect of of shearwater biology. 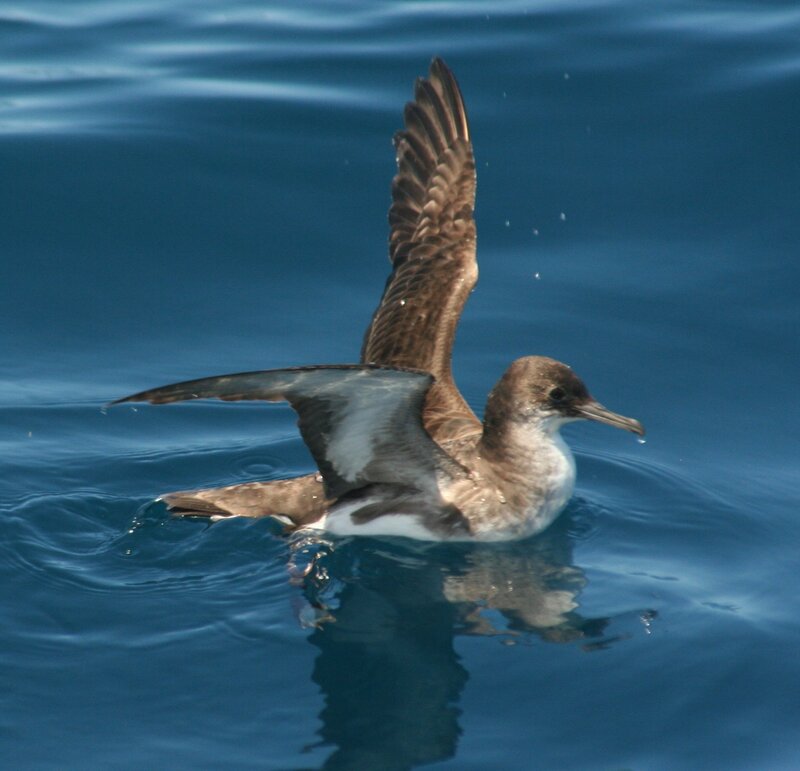 Shearwaters, like most petrels, are widely admired as masters of flight. While perhaps this reaches the apex in the order in the albatrosses and storm-petrels, shearwaters are certainly distinctive in their capacity to travel large distances with the the minimum amount of effort. But many species are also capable divers. Among birds there are two main types of diver, the plunge diver, and the pursuit diver. Among the pursuit divers it is the foot propelled divers, which include most of the ducks, the cormorants and shags, the loons or divers and the grebes, are often the better fliers. The two most famous wing divers are the auks and penguins, which are respectively not famous for their ariel dexterity on the one hand and famously incapable of flying at all on the other. Compared to these two groups the shearwaters have long wings seemingly ill suited to underwater propulsion, yet they manage it. How well they manage it has only recently been properly appreciated. Until 15 to twenty years ago they were not regarded as capable divers, but then scientists began to attach depth sensitive capillaries to birds to record their maximum depths on trips out to feed. Astonishing depths began to be recorded. 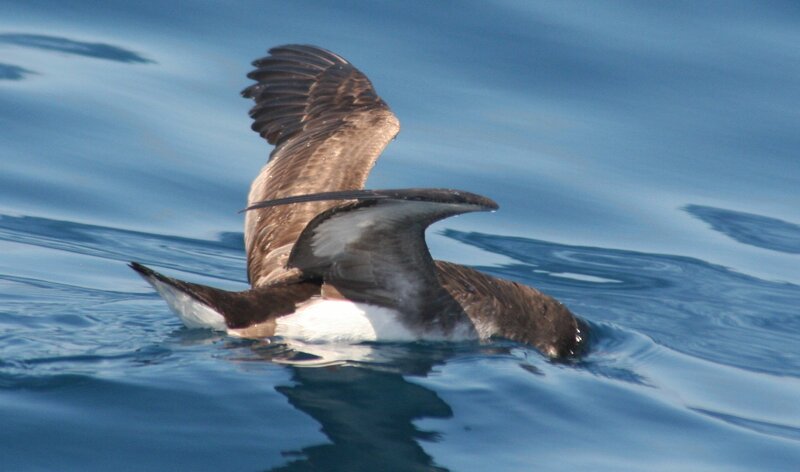 The king of diving is the Short-tailed Shearwater, which has been recorded diving to 70 m below the surface, with average trip depths of 58 m. Other over achievers were Audubon’s Shearwaters, which have made it to 35 m, Sooty Shearwaters (max 67 m, av 39 m) and Wedge-tailed Shearwaters (max 66 m). Amongst the other petrels it should hardly be a surprise that the auk-like Peruvian Diving Petrel can get to 83 m down, but it is quite a surprise that the Light-mantled Sooty Albatross can reach 12.4 m.
Having a look before taking the plunge. The maximum depth reached by Fluttering Shearwaters isn’t known (that I know), but perhaps it can be guestimated Black-vented Shearwaters, which are related to the Fluttering as part of the large Manx complex, and which clocks in at an impressive 52 m. Not at all shabby for a small long winged bird! So true! I only learned about or rather came to notice the amazing diving capacities of petrels and shearwaters when I saw a video on youtube a few years ago of Cory’s Shearwaters. Funny how selective we can sometimes be in our understanding and appreciation of birds. And that is a well-chosen title. I was very confused at first when you talked about Fluttering Shearwaters. The BBC has a great video of shearwaters underwater: https://www.youtube.com/watch?v=zzgk__0bezk. Really stunning.